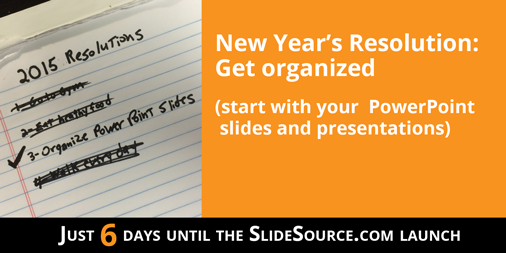 Organizing PowerPoint slides and presentations just became your easiest New Year’s resolution! With SlideSource.com you can create folders and subfolders to organize slides any way you want. Once you have set up your folders, drag and drop existing slides from folder to folder, or upload new slides directly to the folders you created. How you organize your slides is completely up to you… but once in SlideSource, you will always know where to find them. Each folder that you create has an “Action History” button. The action history displays a list of the most recent actions in the folder – such as adding or editing slides – as well as the person who took those actions. SlideSource.com puts you in complete control of all your slides and presentations. SlideSource.com is launching on January 13th! It’s a powerful, slide and presentation library that is intuitive and easy to use. Never lose a slide or version again. With SlideSource.com you and your team will have all of your slides and presentations in a single secure place that’s accessible anywhere at any time.